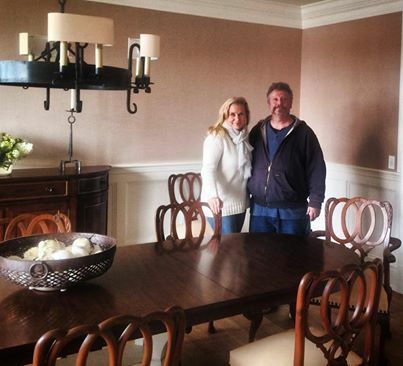 Today finds us in New England at one of our favorite projects with a gifted artisan, Fred Weinle of A & F Restoration. We scored this amazing set of circa 1920 George The Third mahogany dining chairs for our clients at auction last year. Their lines rare and exquisite but their condition fading, we called on Fred and his wife Brenda to restore and reupholster them for us, which they did with amazing results. Now ready to go another 90 years for their new family, these chairs bring a layer of history to the room, which I love, but feel fresh and modern clad in ivory leather by Rose Tarlow with sophisticated spaced nail head trim. All my favorite elements combined - I'm completely in love.